Some agricultural applications include the grinding of plant materials, wood, fertilizers, seeds, straw and tobacco. Rotor mills may be used in the chemical or plastics industries for materials such as synthetic resins, rubber granulate, super-absorbent polymers, activated charcoals, powder coatings and plastics such as PET, PP, ABS, polystyrole, polycarbonate. They are also used for food and feeds like corn, feed pellets, coffee beans, rice, dried fruits and vegetables, sweets, spices and teas. Geology and metallurgy applications may include the grinding of limestone, coal, coke and bentonite, while applications for biology could include animal tissue, collagen, bones, and dried larvae. Rotor mills are also used in the reduction of drugs and pharmaceutical raw materials in the medical and pharmaceutical industries; and the reduction of electronic components (circuit boards) and fossil and secondary fuel waste in the environmental research and recycling industries. 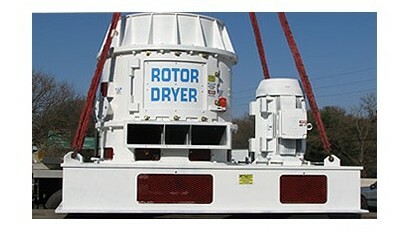 Most rotor mills are powered by electric motors and can operate at various speeds. They also include safety housings to protect the motor and electrical components from dust and material penetration. Cassette systems offer simple loss-free sample recovery and help prevent cross contamination. 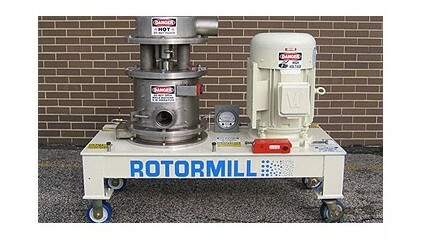 Most rotor mills also include exchangeable grinding and sieve inserts. Grinding tools come in materials including steel, stainless steel, titanium, and stainless steel with wear-resistant coating. Sieves usually come with either trapezoid or round holes of various sizes typically from 0.08 to 10mm. There are also options for rotors and rings including reinforced rims to offer greater stability for the ring sieve; and distance sieves were designed for the specific purpose of grinding brittle and/or temperature sensitive materials such as resins and powder coatings. Some rotors and ring sieves are available with abrasion-resistant coatings for processing abrasive substances like fertilizers. Titanium rotors and ring sieves with titanium-niobium coated cassettes and covers are recommended for heavy-metal-free, non-abrasive materials. There are also a few different options for depositing the feed into the rotor mill. This can be done manually or often times by use of vibratory feeders, which are connected by an interface to the mill. Regular/automatic feed deposit will ensure undifferentiated grinding results while maximizing output as well as eliminating the risk of overloads. Maximum feed sizes may vary among brands and models, but the machines can usually grind materials in a range from 10 to 15 mm. Materials that are larger than this must go through a preliminary reduction via a crusher or mill cutter (depending on the characteristics of the material) before being introduced to the rotor mill for fine grinding. Final fineness across materials grinded/reduced in rotor mills can be expected to be 40 and < 40 µm. Rotor Mills Rotor mills are used for the fine grinding/reduction of a wide variety of materials for many different applications. Particular instruments or models may be more suitable for certain materials, but in general rotor mills are used for soft, fibrous, hard, and even temperature-sensitive samples like liquid nitrogen.